Zephyr uses the nrf51_vbluno51 board configuration to run on the VBLUno51 board, a VNG Bluetooth Low Energy UNO using an nRF51822 ARM processor. 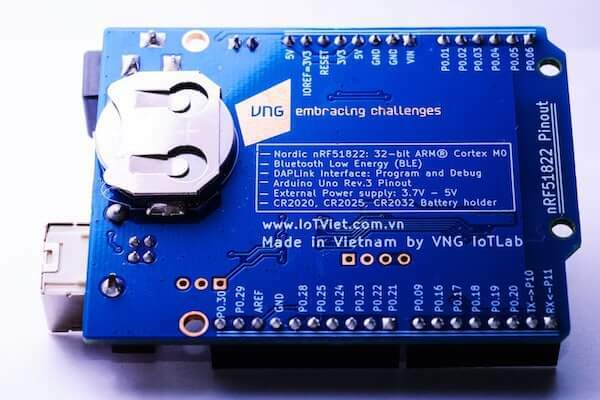 More information about the board can be found at the VBLUno51 wiki page . 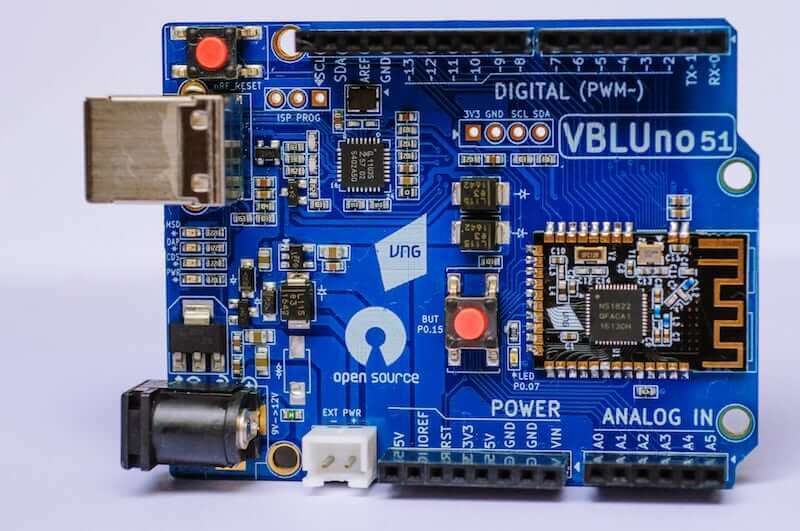 VBLUno51 board has two external oscillators. The frequency of the slow clock is 32.768 kHz. The frequency of the main clock is 16 MHz. Nordic nRF51822: ARM® Cortex™ M0 32bit. UART(1), I2C(2), SPI(1), PWM(3), SWD, Timer 16bit(3). 21 digital channels, 6 ADC 10bit channels. 1 Led and 1 Button onboard. GPIO Voltage: 0 - 3.3V. USB MSD: Drag and Drop programming flash memory. USB HID (DAP): CMSIS-DAP compliant debug channel. USB CDC: Virtual COM port for log, trace and terminal emulation. Supports hardware flow control features (RTS/CTS). FOTA (Firmware over the air): Upgrade firmware over BLE interface. Compiler and IDE: GCC, Keil MDK, IAR, Eclipse, Qt Creator. A lot of tutorials for Arduino, mbed-os and more. Pinout: Arduino Uno Rev3 compliant. Power adapter: +9 -> +12V. 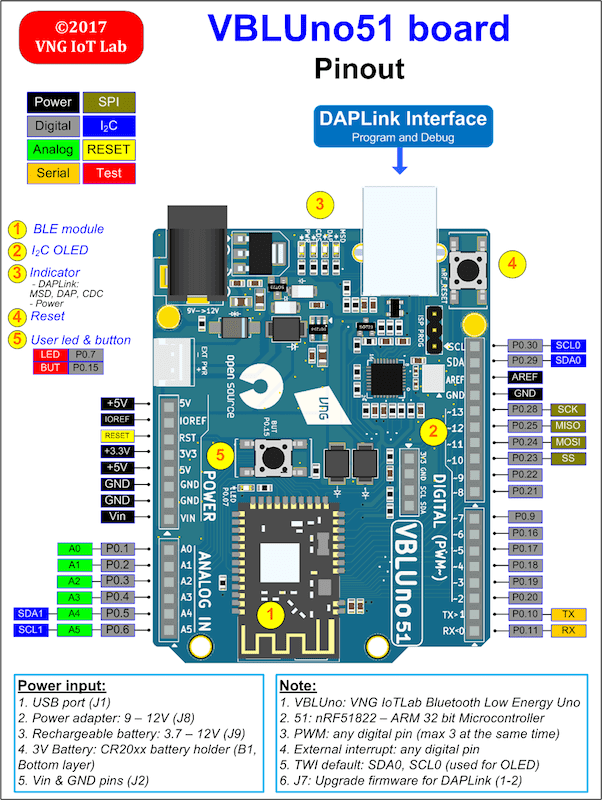 See VBLUno51 wiki page  for full documents and tutorials about the VBLUno51 board. Applications for the nrf51_vbluno51 board configuration can be built and flashed in the usual way (see Build an Application and Run an Application for more details). 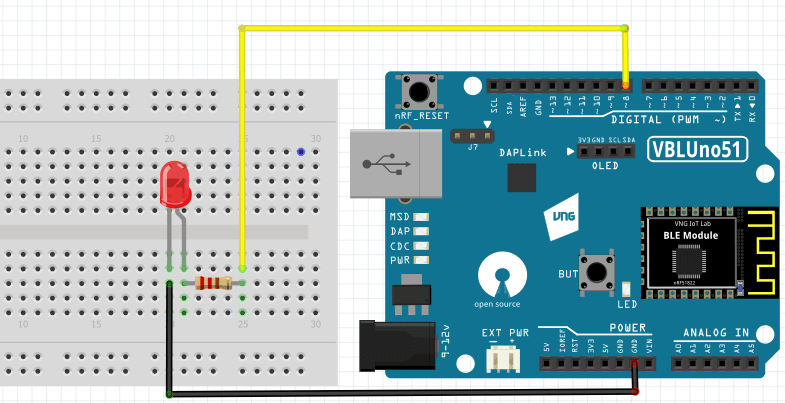 This tutorial uses the blinky application Blinky Application. See the Getting Started Guide for general information on setting up your development environment. Then build and flash the application in the usual way.